This machine is solid and simple and easy to operate through a watertight touchscreen of the basic machine. 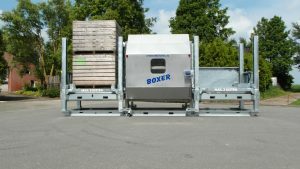 The chain driven lifting system lifts easely 3,5 tons so 2 full boxes can be stacked down and even 3 full boxes can be stacekd. 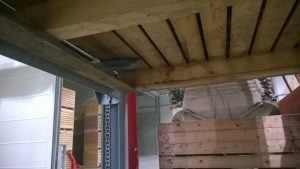 By a certain way of catching and lifting of the box safety is guaranteed and the boxes will not be damaged. 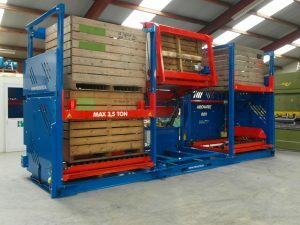 The four long arms catch the box in the pallet hole on more than 4 benches so modulation and peak load weight will be prevented and the lifecycle of your boxes will be extended. The stacking system will bring more efficiency, the filling, emptying and washing machine are suitable to rework the amount of boxes, you can rely on this. 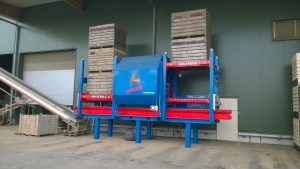 This extremely efficient stacking system will work for you concenring box handling. 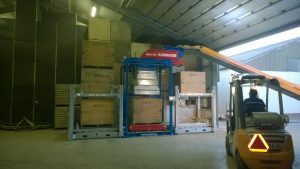 Wether it will be during filling, emptying or washing, efficiency is guaranteed so more work can be done with one forklift. The system easily handles more than 120 boxes per hour so the forklift capacity will rise tremendously. 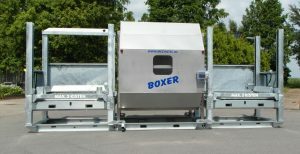 The separate units can be replaced very easy by forklift as the lowframe is also transportframe. This is very convenenient for working on several locations. During the transportation the complete system can be kept by pin and hole construction so excellent working is guaranteed. Even when the parts are connected the pin is very easy to assemble. More or less space under the machine can be simple adjusted by placement of an elevation set.